A recent article in The Buffalo News, citing a study of downtown parking, offers some interesting blog fodder. The Desman Associates study asserts that the parking situation in Buffalo is a mess, and requires better management. The report recommends hiring a "parking czar" at $140,000 salary to consolidate parking management. As I recall, Desman previously produced studies in 2001 and 2006 which basically said the same thing, minus the "parking czar" baloney. The Buffalo News' take on the Desman study does get it generally right, however: "The dominant theme in the report is that too many entities are involved in city parking, creating 'shortsighted' and disjointed management." This much is true. But one quote in particular stands out: "'Downtown can’t begin to compete with suburban office parks without convenient and affordable parking,' said Schmand, whose nonprofit agency represents the interests of downtown stakeholders and residents." If anything, this simply demonstrates how shortsighted and incoherent our public discussion has become on such issues. If city leaders think that parking is the main asset—and don't recognize the many natural urban advantages downtown has over the suburbs—then the whole exercise is guaranteed to fail. This strategy will simply end-up undermining the value of the city, leading to a dead downtown like the one we've got. Like many other mangled cities, we've been trying this strategy for decades and failing, as the condition of our downtown attests. We can't keep playing this self-defeating game. Who has the guts to finally stand up and stop this nonsense? Also, there's my old saying, which I've oft repeated: Like all cities, we really have one essential choice; we can have a vibrant downtown where everyone complains about parking, or we can have a dead downtown where everyone complains about parking. If you think about it, that's the only choice. Really. For years, I’ve been involved with The New Millennium Group, a local community activist organization dedicated to progressive planning, economic development, and revitalization. 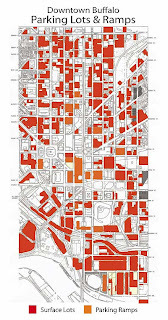 In 2003, NMG did a downtown parking survey that showed over 50% of the land area of downtown Buffalo dedicated to surface parking (see graphic). The fresh angle is this: the city doesn't need to add another high-priced manager and yet another layer of bureaucracy. We can get much better management of downtown transportation/parking assets if we better utilize the resources we've already got. Private companies routinely reorganize management structures to adapt to changing conditions, so why can't the city? We've already got a planning department that studies and understands these issues (and the many related issues, too) and has the expertise to effectively manage parking by putting it in its proper context—which is the problem to begin with. No one ever visits [insert any great city here] and comes home swooning over how fabulous the parking was. Great inaugural post, Joe, whoever you are. I'm adding you to the list of blogs I read...don't disappear on me like a fart in the wind after a half dozen posts! Great point about the parking situation. A more organized approach to our parking situation is in order. Thanks to all for the inaugural props! I'll try not to disappear after only a few posts, but just so everyone is properly warned: don't expect daily rants. I'm going for quality over quantity. Anyway, I've been doing more thinking on this from a urban planning perspective. For a city, the automobile and it's storage requirements are the proverbial monster with an insatiable appetite. The monster threatens to destroy the city if it isn't fed. Understandably afraid, everyone agrees that the monster must be appeased. But the more it is fed, the bigger, hungrier, and more demanding it gets. And so it goes, until downtown is destroyed anyway. This defensive strategy effectively puts the monster in charge. If we actually want control over our downtown and the future of our community, then the smart solution is to put our efforts into taming the monster. To do that, we must invest in alternatives to driving, and utilize our other natural urban advantages. If we do that, we’ll find that not only can the monster be tamed, but even trained. Otherwise, we'll have no choice but to keep on feeding the beast. And keep hoping, wishing, and praying. The monster has been in charge for a long time now. Nothing short of an even worse economic crisis and prolonged energy shortages will change that. Until then our politicians and much of the electorate will want to keep "staying the course" by building more roads and sprawl development. I live in Minneapolis and have never even been to Buffalo; however, I discovered the Fix Buffalo Today blog and now have this totally weird obsession with Buffalo. Just wanted to let you know that in MPLS we are currently radically rethinking the issue of parking in the urban environment and the City right now is looking at changing parking requirements from the current MINIMUM parking requirements for certain uses to MAXIMUM requirements. Talk about completely turning the old thinking right on its head! Nice wording of an old issue that people to not want to acknowledge or change their misconceptions on. The more surface or single use parking you add downtown the more you will need because of the lost density and walkability. Not many can see past the free (in reality subsidized) parking. It's an uphill battle but one well worth fighting for. We will never demolish our way to success. Great post, it's very exciting to see the start of a informative planning blog. On the note of parking and issues of transportation in Buffalo, I want to refer you and your readers to the brand new blog for a relatively new non-profit, Buffalo CarShare. For those who aren't familiar with the concept, car sharing "is a service that offers the piece-of-mind of the automobile without the up-front costs, hassles, or environmental impacts of private vehicle ownership. Members rent vehicles on an hourly basis for errands or irregular trips, while relying on other modes of transportation (such as walking, bicycling, taking transit or carpooling) for their daily commute." Buffalo CarShare's blog can be visited at http://www.buffalocarshare.blogspot.com/ . I am looking forward to your future posts and I hope you'll look be looking forward to ours! @Anonymous: Changing minimum parking requirements to maximum requirements is a very enlightened step. Apparently you're a little ahead of us in Minneapolis! Actually, many progressive municipalities are reforming their zoning codes in similar ways. As it turns out, the conventional wisdom is often upside-down. In most conventional zoning cases, if you swap minimum for maximum, and vice-versa, you'll actually get a better result. For example: maximum parking instead of minimum parking; minimum stories instead of maximum stories; maximum street width instead of minimum width; or maximum lot size instead of minimum. I can't wait to read your follow up piece. I've always felt that the Kensington expressway killed the city, the parking lots rate a close second. Great article Joe, very well written. I look forward to future posts. Much like Minneapolis, Rochester (that semi-mythical city just 70 miles down the Thruway) has also completely re-written its zoning code in 2003. Downtown (which we call the Center City District) does not require parking at all. All other areas of the city have minimal parking requirements and impose a maximum parking cap. That code change, along, does not guarantee success. Developers (usually of the Rite Aid, McDonald's, Tim Hortons types) come to the city and say "your maximum parking requirements are mucht too low for our corporate standards, we are going to apply for a zoning variance." And the variance is almost always granted. How could the Zoning Board of Appeals possibly stand in the way of the "economic development" that a Tim Hortons represents? Incidentally, I'm also amused by the Buffalo-ism of "parking ramp." Even in Rochester, that term is met with blank stares. We call them "garages." I started this blog mainly to stop torturing my wife. Also, in my humble opinion, there are scant few good urban planning blogs, so I wanted to create an enlightening, provocative, and entertaining forum for planning-focused issues in my hometown of Buffalo, NY. In addition to urban planning, I'll be covering economics, politics, and probably anything else I need to get off my chest. So, whether or not you agree, post a comment and let me know. Maybe it'll help raise the level of the local conversation.